Ferocious Dog smashed our Sunday night last year with many of you posting on Facebook they were your favourite act, so … drum roll … we’ve got them back! With their on stage presence and energy they really know how to put on a live show. They will be performing at Wickham Festival 2018 on Saturday 4th August. With other acts like Gordie MacKeeman and Gaz Brookfield performing on the same night, this is looking like an energy soaked Saturday to remember. Why not come prepared with some suitable attire? John Leonard – 5-string banjo, Tenor Banjo, Mandolin, Guitars, Bouzouki, Whistles, Uilleann Pipes, Accordion – and a bit of shouting! The combination of instruments creates a palette of sound that offers infinite variations: going in hard to get the audience up and moving, or slipping into melodic passages and dub-like fusions. The songs are deeply personal and their fans can really identify with the words. 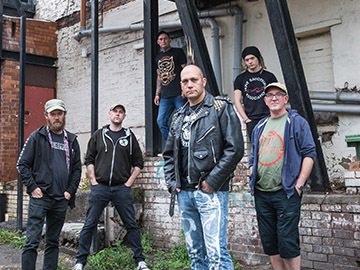 Ferocious Dog are well known and popular for their high octane live performances. Ferocious Dog is with Darren Hallsworth and 8 others. This Thursday it’ll be on your door mats and available via iTunes, Google Play, Amazon, Deezer & even Spotify!